The ulna (/ˈʌlnə/) or elbow bane (Laitin:elbow) is ane o the twa lang banes in the foreairm, the ither bein the radius. 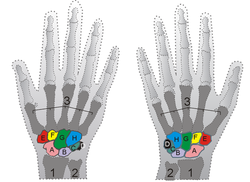 ↑ Entry "ulna" in Merriam-Webster Online Dictionary. This page wis last eeditit on 22 August 2014, at 00:47.